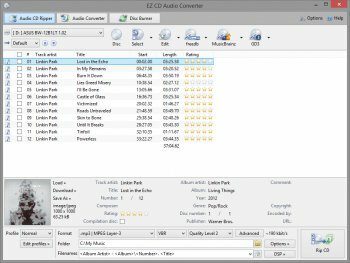 EZ CD Audio Converter lets you convert audio files to MP3, FLAC, M4A, AAC, Opus, Apple Lossless, Vorbis, and many more audio formats. Securely rip audio CDs in perfect digital quality. Batch convert many audio files at once. Convert audio from 50+ file formats. Burn audio CDs. For the money this really can't be beat IMHO. I've tried the free ones but they just can't compare. The closest I've found for Free Is Fre:AC and it still isn't nearly as configurable as EZ CD Audio Converter. This has all the bells and whistles put in a package that even most novices will find intuitive and practical. The resulting rips/conversions are of the utmost quality and free upgrades for life make this a true blessing for audiophiles and casual listeners alike. Where are the old version history's and bug fixes at your website to compare with this version? Did you actually change anything or did you just say you did? Why do you have a new version every few days with no real improvement? Went to "Advanced" and turned on CRC error protection, then changed quality from "high" to "highest"
EZ CD Audio Converter v6.1 is CRAP! 4. EZ CD Audio Converter costs $29.95 @ website (why is it listed @ $40 here? Heck, I DOUBLE Dare ya! Still the best choice for bulk audio conversion. This is a very nice program. This is the best program out there for audio conversion/CD ripping. New version supports multi threading for modern processors and it has the best codec support. The developer is really on the ball with regard to feature requests and it is frequently updated. Well worth the money. CDx does a pretty good job for me & it's free. Pros: It's great! Does everything one could imagine with audio. Rips, Converts, Tags, Burns, etc... This little gem can even extract audio from video files. This has all of the major and some less known codecs. The audio quality is better than any other audio software I've tried. Bottom Line: For the money this really can't be beat IMHO. I've tried the free ones but they just can't compare. The closest I've found for Free Is Fre:AC and it still isn't nearly as configurable as EZ CD Audio Converter. This has all the bells and whistles put in a package that even most novices will find intuitive and practical. The resulting rips/conversions are of the utmost quality and free upgrades for life make this a true blessing for audiophiles and casual listeners alike. Bottom Line: Good piece of soft. Oh yeah, the price here now reflects the price at the website! Bottom Line: EZ CD Audio Converter v6.1 is CRAP! I am extremely pleased with the program. However, I tried to get a free program recommended in this tread "Exact Audio Copy ". I pressed the download and ended up nearly to install a program called FoxTab. I stopped in the last second. I even donated 10 $ to this seemingly scam site. I tryed Easy CD-DA to convert my files from WMA lossless to MP3 320 mbit. It worked super, and I paid the fee to buy it. Beware of some of the so called free programs, as they may be dangerous. Go for one of several free programs that do the job as well as this & maybe better. This is a good program but why use it when there a several free programs that do the same thing? Just a rip-off of Exact Audio Copy which does the same thing for free.